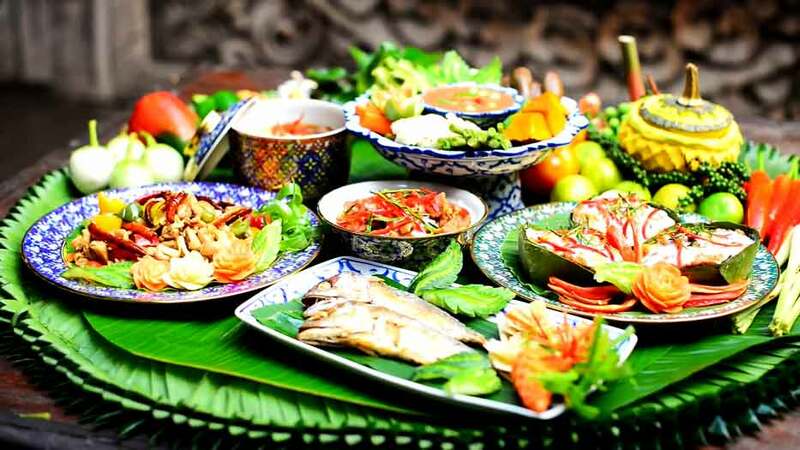 Thai Food – One of the world’s cuisine! “What is Thai food? Every country in the world has its own food profile. It reflects its culture, environment, ingenuity and values. In the case of Thailand, these words come to mind: intricacy; attention to detail; texture; colour; taste; and the use of ingredients with medical benefits, as well as good flavour. Typical flavours and tastes are; spicy, sour, hot and sweet. The success of these dishes often rely on delightful contrasts, which ensures that the palate never becomes jaded. Delicacies such as prawns in coconut, or succulent chicken wrapped in a pandanus leaf, take their place amongst an array of culinary specialties. Indeed, it is possible to enjoy every day of your stay a different type of dish and you will still leave with plenty untested. If you do not like chilies, just say “Mai phed” (not spicy) by the time you order and you will receive a less spicy dish, which may include any taste, ranging from the sweetness of coconut milk or saltiness of fermented fish, to the freshness of herbs, lemon grass, garlic or even nutmeg. Every region has its own specialties. The north is famous for a pork sausage called “Sai Oua” and the northeast is famous for its sticky rice (Khao Niaw) which is served with barbecued meat and fresh salads, such as Som Tam (Papaya Salad). The southern dishes are influenced by the Muslims, who live in the south and Malaysians, and of course, all kinds of seafood, including crab, squid, shark, freshly cooked lobsters and mussels. Do not worry if you have a sweet tooth – you are not likely to stay hungry at all. Many Thai sweets are based on rice flour, coconut milk, palm sugar and sticky rice and just about all of them are delicious. There are many Food Stalls on the streets of Chaweng, Maenam and the rest of Koh Samui, but, at the Siam Residence Beach Restaurant, you can enjoy delicious Thai Authentic cuisine in a delightful atmosphere with a stunning sunset. If you want to take home the taste of Thailand, join our Thai Cooking Class. Learn with our passionate Chef the basic skills of the local cuisine. Discover the fresh ingredients and simple cooking methods that produce such wonderful dishes.